What do you do when you’re an ex-jazz guitarist who’s leading his own band in the still uncertain world of rock ‘n’ roll, a genre that thus far has featured predominantly boisterous vocalists and romping sax players? Well, in Tiny Grimes case you get somebody who certainly meets the latter requirement and you give him the chance to fill both roles and hope for the best. This was not a record I was initially going to include in the rolls chronicling January 1949’s rock releases. For starters it’s sitting uneasily in rock to begin with, by far the bluesiest side Grimes has released to date with a structure that certainly might be more comfortable in that realm. But here it is nonetheless and for the decision regarding its ultimate inclusion we have to go back to the basic ground rules of what it takes to qualify as rock in the still early days of the medium. It’s there we remember that one of the primary requirements is the classification of the artist themselves. No matter what his business cards might’ve said Tiny Grimes had forsaken jazz to throw in with rock ‘n’ roll a year earlier and thus far he had stuck with it, finally scoring a hit in the fall of this past year which further cemented his place in the rock landscape. It might not have been a declaration of a lifelong commitment, ‘til death do us part and all that, but until he filed for divorce and moved out of the house lock, stock and barrel then for all intents and purposes he was a rocker. He lived in that part of town full time now, received his mail there, hosted neighborhood barbecues and walked his dog in the local park. His jazz residency had expired by early 1948 and while he may have gone to school there, like many others once he graduated he moved away from his old hometown and would only occasionally go back for a visit over the next decade. But at no point did he even look at houses in the blues neighborhood. This would be the closest he’d get and at best this was just a Sunday drive through that part of town. He might stop for a bite to eat, but he wasn’t calling realtors or checking out the school system for his kids. So while its inclusion here might seem a little ill-fitting around the edges, Nightmare Blues fits best in rock and thus we’ll take a look at it and see why Grimes made the right decision to skew further away from the blues this song borders on and stay in the rock ‘n’ roll zip code for the most part. Interestingly though while it’s Grimes who gets the label credit here and whose career arc is being defined in part by this record’s release, the real focus of Nightmare Blues and thus the review of this record is Red Prysock, a bawdy saxophonist of the new school of rock who we’ve met (and praised) in our initial introduction to on Midnight Special, but who now steps up and commands the spotlight for a turn as a vocalist, a role he was not quite as well suited for. Wilbur Prysock was born in 1926 and as soon as he was old enough to voice his displeasure with his given name he was dubbed Red. Not long after that he picked up the saxophone and started making quite a racket. He was squarely on the generational divide of those coming up, on one side were the slightly older brethren who were strictly jazz-influenced and on the other side were those whose heads were turned by the raunchier style of rock ‘n’ roll, a style which came into being just as he himself was about to turn 22. He certainly could’ve gone either way but he seemed to make his intentions clear from the start because it was obvious that had no overwhelming desire to try his hand in bop where the really talented jazz sax stars were heading (and ironically where Grimes, one of the few guitarists to make a name for himself there, was soon departing). Instead Prysock was content to seek out more commercial styles. 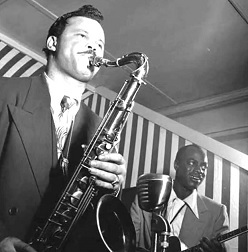 At the time that meant mainstream jazz, which included some noteworthy honkers in their own right, from Illinois Jacquet to Arnett Cobb, or it meant venturing into rock ‘n’ roll where by early 1948 many of his peers were planting their flag and seeing their fortunes rise with its rapid ascendency into the commercial mainstream of black music. Maybe Prysock figured he wouldn’t necessarily be forced to make that choice himself when he signed up with Grimes, someone who was clearly comfortable in both realms, after Tiny jettisoned John “Badman” Hardee mid-way through 1948. Soon Prysock came on board and they struck gold in their very first session together with Midnight Special, a song propelled in part by Prysock’s moody sax playing. Though it was an illegal session cut on a sly during the lengthy recording ban, seemingly with the specific intent on getting that song on record to take advantage of the blossoming rock instrumental sound that ruled throughout the year, Atlantic Records was clearly taking no chances in running out of sides to issue should this ban last another year, so they cut ten songs including one that was chopped into two parts. But whether they actually had enough material planned for ten whole cuts is another question. They may have… who knows, Grimes might’ve added Prysock for the intent purpose of positioning him as a singer to expand his group’s marketability. After all Red’s older brother, Arthur Prysock, was already one of the more touted vocalists in black music as the featured male singer for popular bandleader Buddy Johnson (whose sister Ella was the star female lead singer). Somehow I doubt this though, for while Arthur had a very impressive baritone voice and the projection, control and delicacy that made him one of the top crooners in the land in the mid to late 1940’s, Red sounds as if he is half-drunk and singing to himself as if he thought nobody was home as he made himself a late night sandwich. His voice itself is alright I suppose, he too has a chesty baritone, but in every other way he seems as if he must’ve been Arthur’s adopted brother, not a blood relation, because unlike his older sibling he possesses none of the knowledge of how to use it to his advantage. Whether this was in fact a song they had written well in advance and had ready to go or if it was merely worked up on the spot in the studio, the latter probably being more likely, it doesn’t make much difference because while the idea itself is fine – recounting the depths of despair he feels after his woman left him – and even has some good lyrical imagery as he battles the devil for his soul in his personal nocturnal hell, the song is far too rudimentary to be gripping no matter whose life is at stake. But here’s where Grimes idiosyncratic nature comes in and takes this out of the blues bag and places it in stylistic limbo. In 1948 when this was cut the guitar was not a very prominent instrument in rock, nor pop, and was only fleetingly used in gospel and even jazz other than as a rhythm instrument. But in blues the guitar was the primary instrument and this being at the very least a progeny of the blues you’d expect that Grimes, who’d mastered the guitar like few before him, would use it as a chance to show off… to jump into another field, even if just for a single performance, and tear things up to state his claim as an unrivaled talent. It’s an ego thing if nothing else. Like a great athlete showing off his arm, or his speed or jumping ability in front of other athletes just to let them know he is to be respected, even feared, the same holds true for guitarists who would want to flex their muscles if given the chance. Considering Grimes came from a jazz background where cutting contests amongst musicians, sax players especially, were legendary, you’d think for sure that he’d stretch out on the guitar at some point during something that had at least one foot in the blues idiom where such a display would be more at home. Yet he doesn’t and that is the first sign that he at least wasn’t thinking of this as a blues song, no matter what the title suggested. That’s further proven by the accompaniment that he does emphasize, namely a tinkly piano that is closer to a supper club practitioner than a barrelhouse stomper, taking this even further from the rural backwoods of the south, or the cramped tenements of the city where the blues generally thrived and placing it instead in the more middle-class environs of the urban nightclub scene. This struggle for musical identity might be more easily settled if Prysock was a more skilled vocalist, because while his slow despondent delivery hints at some deeper blues (his voice is too rich and deep for cocktail blues, though that might be the closest match stylistically), his inability to deviate from the brooding pace means he can’t take this in the directions Grimes might’ve otherwise chosen. It calls out for a far more effective shouted stop-time vocal than the one Prysock painfully delivers, something which – in the right hands, like Roy Brown – would’ve carried it fully into the rock realm and left no doubt as to where it was aiming. Instead we get a one-note performance by someone who viewed singing as a secondary role (if that), making it monotonous and dull for the most part. Maybe not surprisingly it’s Prysock’s primary role that brings this back in line with our sensibilities in the rock field, as the best moments are found in his sax riffs that opens the song, and especially his closing, an aching, drawn-out bout of despair capped, ironically enough, by the same refrain that had closed out Midnight Special, thereby almost confirming it was little more than a thrown together piece designed to fill out the session and give Prysock a little bit more notoriety going forward should anybody care to listen. Ultimately, while we DO care enough to at least listen and give them the benefit of the doubt as to their intent, it’s easy to see why Nightmare Blues was nothing but a half-hearted throwaway. A record stuck between multiple genres, none of which was assertive enough to claim it fully by the end, maybe because none of the genres really cared after hearing its plodding mediocrity. I think it’s safe to say that even Arthur Prysock couldn’t have rescued this one and if I wasn’t feeling particularly generous in regards to the intriguing title, some decent lyrics and a sax loop recycled from a much better record in the fade, it’s doubtful it would even earn the following score, whether in a rock review OR a blues review. Leave a reply on "Tiny Grimes: “Nightmare Blues”"